Enjoy music or take calls hands-free using this pair of Earphones for Samsung S8 Plus. Superior sound quality: With 8mm and 11mm speaker units, they deliver balanced sound for bass, mids, and highs. Enjoy crisp, rich, and balanced sounds across the entire audio spectrum. Built-in Mic: Take calls handsfree using the in ear headphones. On-line control: Enjoy easy access to a range of your device's features with the earphones in-line remote. Tangle-free cable: These hybrid, canal-type earphones feature a sleek metal finish and tangle-free, fabric cable. 3.5mm jack: Compatible with most smartphones. Update: 9/1/18 Mine arrived this morning. These earphones are fake. No way are the genuine AKG earphones. Very obvious from the poor sound quality etc. So they're replicas of the AKGs? In other words, not the genuine AKG earphones? For that price they're worth a try even as a back up pair. Not very good sound levels for podcasts but great for calls. Surprised blatant fakes are allowed on here. The logo is clearly meant to look like akg. Surprised blatant fakes are allowed on here. The logo is clearly meant to …Surprised blatant fakes are allowed on here. The logo is clearly meant to look like akg. I have bought them a month ago, for same price. They are really good quality and sound is amazingly good. If they are fakes - they have been made very well. All and all they worth £1.50 for sure. Just for s8? What about other Samsung phones? Absolutely ridiculous..Can't believe you've shown me this site called Zapals. I'm going to end up with no wage left. Heat added op. Another mass produced poor quality replica crap mega deal what thousands …Another mass produced poor quality replica crap mega deal what thousands will fall for only to be left scorned when they arrive and inevitably disappoint on first usage, soon develop faults or plain just arrive broken, all safe in the knowledge that near enough no-one will actually bother to fully pursue such relatively small refunds.It's a great business model the whole churn 'em out flog 'em cheap effort. Great profit margins achieved for the effort. Zero ethics or responsibility required and all pretty much with zero recourse. The gullible masses deserve all they get...Amazon and eBay is almost entirely propped up on this kinda 'commerse'. Magic! Look pal, I have them and using every day for 3rd week now-not a single problem. And when you compare these with headphones which came with my S8+ you can't tell a difference. If they comes broken or you don't like something- just claim money back from PayPal. Ouch.. Sounds like someone's had their fingers burned before..
Are these a universal fit to other mobile phones? Ordered 4, heat added thanks guys gr8 find keep it up! I have bought them a month ago, for same price. They are really good …I have bought them a month ago, for same price. They are really good quality and sound is amazingly good. If they are fakes - they have been made very well. All and all they worth £1.50 for sure. You talked me into it. I'd be very surprised if they are fakes based on your opinion. Ones for £7 on Amazon are fakes and sound terrible, and have virtually zero bass compared to the genuine ones. Genuine ones sound very good for phone bundled buds. Fairly similar to the Quadbeats that came with the LG G3/4 which were the first decent pair I've seen bundled with any phone. Looking at the images (if that means anything), they look identical to the pair I got bundled with my phone. I actually think they sound pretty good. Fingers crossed these will be genuine. Buy cheap crap, get cheap crap. Eh? God I hate this site that's the third thing I've ordered today, and yet another White Bearded Reindeer. Probably. They've crudely photoshoped the logo on that site though, and make no mention of them being AKG or genuine etc.. I would expect them to be fakes 100%. The ones in this deal, I'm skeptical of, but have ordered based on another members feedback. There are more fakes than genuine sets of these out there though, so I will honestly be surprised if either are any good. These won't work with pixel 1st gen. Not sure about new gen! Cheers op. Shall compare with my original pair. Mine arrived this morning. These earphones are 100% fake. No way are the genuine AKG earphones. Very obvious from the poor sound quality. Vocals are horrendously muffled, like you're listening to something underwater etc. No different sized ear tips. Definitely NOT the earphones supplied with the Galaxy S8. I use the non fake version of these that came with my S8 and they are superb. If anyone thinks the sound quality is bad on these, they are clearly fakes. Got my originals with my S8 and the sound quality is much poorer than those I got with my old iPhone. And they don't stay in-ear properly. just got mine - absolute crap ! - but ok for listening to talk radio - music is unbearable - but then again so is all the music on the radio ! Why on earth are fake items allowed to be posted on this site? Got mine today also, they're fake. Should be reported as expired as this is a fake! Paypal refunds all round then? LOL. When you think about it, it's pretty silly we all bought these. They're currently 74p inc P&P from China. 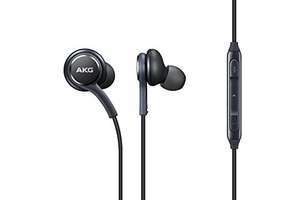 Never in a million years could genuine AKG earphones be manufactured and posted for that price. Received my two sets today - yup simply cheap garbage and if they are not fakes, AKG might as well give up! The first set is not working on the right ear. The second set has more sound coming out of the left side than the right.